Splendidly spicy! 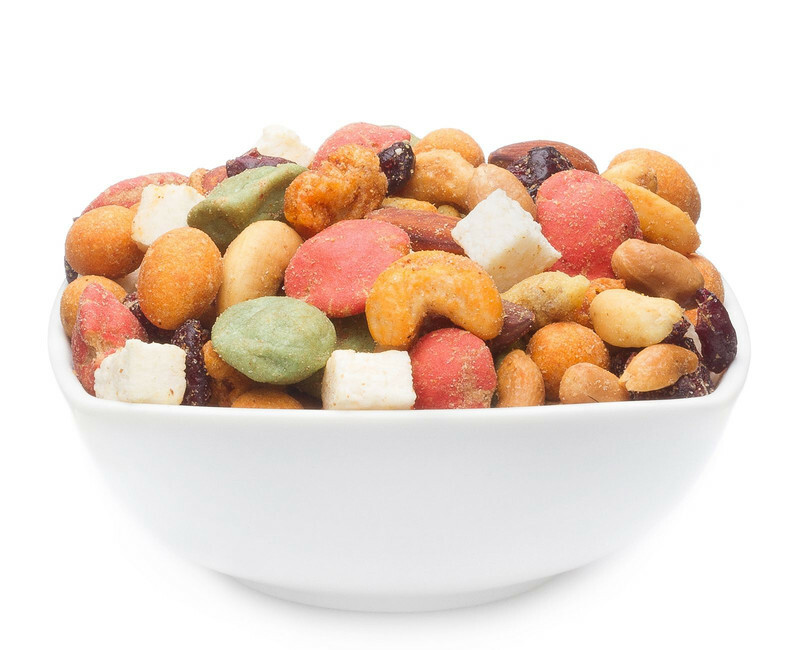 The combination of spicy nuts, some of them with Wasabi, and exotic fruit and coconut cubes definitely is one of a kind! PEANUT, ALMOND, CASHEW, MACADAMIA, Cranberry, coconut, Wasabi, rice, starch, WHEAT, potato, glucose, fructose, dextrose, sugar, beef gelatin, vegetable oil, salt, EGG, onion, chili, curry, spice,Paprika, garlic, NFE-PN.mod. Cornflour, maltodextrin, baking agent:E450, E500i, E500iii, E503ii, flavour enhancer:E621, E635, citric acid. coloring:E102, E124, E133. Contain traces of MAIZE, SESAME, SOY, MUSTARD, SULPHUR DIOXIDE and SULPHITE. May have an adverse effect on the activity and attention of children. For everyone's taste: it just has to be spicy! This mix is really something special: peanuts, peanuts in dough cover, Wasabi nuts - all that already makes an incredible combination. But it gets better! Dried cranberries add a distictive sweetness and coconut cubes moderate the spiciness. All in all you get a firework of flavour! Our hint: savour them nice and slowly! Cranberries actually taste sharp and very sour, but in a dried state they get a mild sweetness that make them even tastier. Coconuts are the predominant symbol for tropical coasts, and they contain plenty of protein and minerals. That's just a side effect, though, the main thing still is: yummy! Combined with the spicy nuts this mix tastes just wonderful! Snack until you can snack no more! The name already gives it away, this mix is simply perfect for fun snacking. But you can make even more fun and yummy things with it. How about sweet spicy muffins with a special crunch? Or as a complement to your salad? Give it a try!